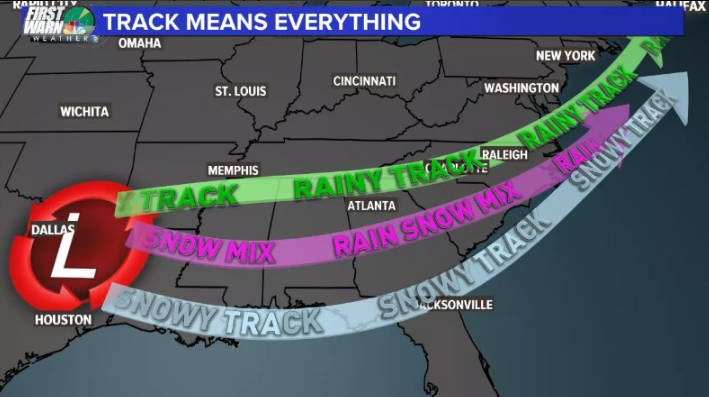 Why Are Winter Storm Tracks So Important? DISCUSSION: During any part of the winter season, there is little to no debate that one of the hotter topics when it comes to winter weather has to deal with the track of coastal low-pressure systems. The reason for why this is such a hot button topic during the climatological Winter-time months is the fact that a change in forecast low-pressure center track by a matter of miles will often mean the difference between an all-out classic snowstorm, a slushy mess, or even a flat-out cold rain event. This is often a critical problem for forecasters and the general public alike since many people will often rely on the exact words of their local weather broadcaster to get an idea of what to expect for a given situation. However, when such projections prove to be incorrect, this can often lead to major problems. Having said that, it is worth noting that there are several legitimate reasons for why such forecast issues arise in the first place. To start, when a local weather forecaster is trying to anticipate the track of a given low-pressure system, a key component has to do with the prevailing photo of the low to mid-levels of the atmosphere as well as how the upper-level atmospheric dynamics will play into how a developing Winter-time extratropical cyclone may travel over some given time-frame. These factors alone create a very transient and fluid situation which can often be very hard to predict of very short timescales and therefore, will often lead to tremendous uncertainty in terms of snowfall forecast cut-off zones for a specified region for any given winter storm scenario. In addition, another factor which plays into the critical importance of low-pressure track forecasting accuracy is the reality that depending on the strength of the low-level winds in the warm sector of a developing coastal low-pressure system, this will often largely determined how much warm air and to how much of a spatial extent warm air is able to surge northward and impinge on the evolving “freezing line” (i.e., the precipitation line which separates the sectors of rain and snow, respectively). Hence, if there happens to be a stronger low-level surge of warm air closer to the surface of the Earth, this can often lead to a consequential northward nudging of the corresponding freezing line and can quickly cut down on forecast snowfall totals. As shown in the idealized forecast graphic attached above (courtesy of NBC Chief Meteorologist Brad Panovich), low-pressure center tracks across the southeastern United States will quite often have a substantial influence on the spatial extent of the accumulating snowfall potential and thus, leaving little to no surprise for why the southeast is often an uncertain forecast when it comes to snowfall forecasts with developing Winter-time coastal low-pressure systems. To learn more about other global weather education topics, be sure to click here!